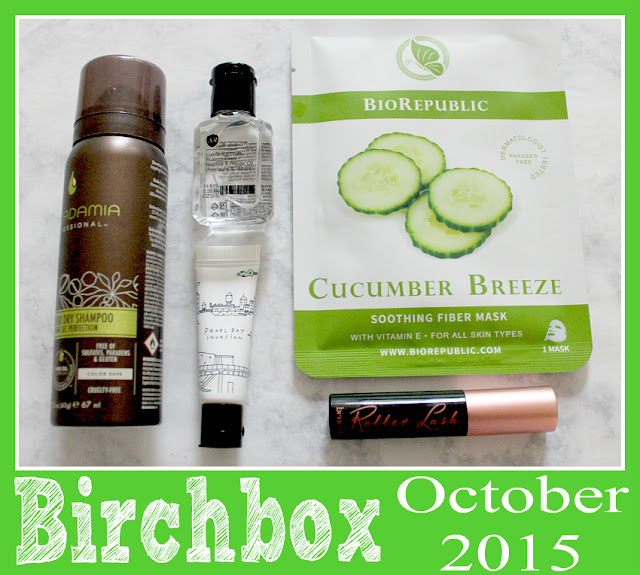 This month's Birchbox was a grand slam! It contained all of my favorite products but from brands I have never tried. I was excited to dig in and start using the products. For the first time ever, I was able to use all 5 products on the same day! This not only highlights for a brighter complexion but moisturizes also. It's available in two shades. I was sent "Baby Pink Clam". It's adds a nice, subtle touch of color and gives a dewy appearance. I have short and straight lashes, and this mascara totally transformed my lashes. This specially formulated mascara eliminates the need for an eyelash curler. It's a built-in bonus of the mascara. Let me tell you...I have a new favorite dry shampoo. I loved the way this spray was translucent. Rather than a powder based dry shampoo, this one uses rice and potato starches to absorb excess natural oils in the scalp. And it smells great. It's a keep, I tell ya. This mask is soothing and calming and a great remedy for stressed out skin. I'm going through some major peri menopause skin right now, and this mask was a welcome relief. It's also ideal for rosacea flareups where skin is often inflammed. Touted as the little black dress of hair care, this is a must-have in your beauty arsenal. Restores overstyled hair and dry ends and brings back natural shine to dull, lifeless hair. To see all of my Birchbox posts, click here. To see more of my favorite beauty products, check out my Beauty board on Pinterest.